Our compact low-cost SEC 3000 Gas Detector is able to monitor over 40 different toxic gases. In 2017 Sensor Electronics Corporation celebrates 26 years of being in the gas detection industry. Sensor Electronics is a worldwide leader in the development and production of innovative toxic gas detectors, infrared gas detectors and gas analyzers. Sensor Electronics employees are the core strength of our company. Our ongoing research and development provides new gas detection products along with special product designs making Sensor Electronics unique compared to others within the industry. Our business units work together as a team. All of our engineering, manufacturing, technical support and sales teams reside in our headquarters located Minneapolis, Minnesota. We take pride that we do not outsource our production outside of the USA. Someone is always personally ready to assist you with your gas detector and gas analyzer needs. Our number one priority is customer satisfaction. Sensor Electronics products are designed with customer requirements in mind, providing the best suited products for applications. After sale customer service and technical assistance is responsive building strong customer relationships over the years. 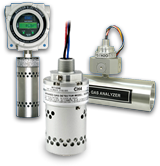 Another factor that makes Sensor Electronics unique is the ability to listen to our customer’s requirements and customize our gas detection equipment to meet specific applications. We are proud of the reputation that we have established for designing and manufacturing the most reliable gas detectors and gas analyzers in the gas detection industry. We strive to safely protect your personnel and property. We specialize in infrared gas detectors and analyzers. Through further innovation and engineering excellence, we will continue to provide leading edge products and world class service to our valued customers.